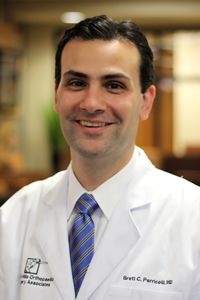 Dr. Brett Perricelli specializes in in hip and knee replacement surgery and has been with South Hills Orthopaedic Surgery Associates since 2011. But it was an event early in his childhood that led him to become an Orthopaedic Surgeon. Dr. Perricelli received his Bachelor’s Degree in Biology, with a minor in religion from Bucknell University before attending medical school at the University of Pittsburgh School of Medicine. He stayed at UPMC for three years of a general surgery residency, followed by an orthopaedic residency, where he served as Chief Resident. He completed advanced subspecialty fellowship training in Hip and Knee replacement and revision at the OrthoCarolina Hip and Knee Center in Charlotte, NC. While in Charlotte, Dr. Perricelli learned the most advanced techniques in primary and revision hip and knee replacement surgery including: less invasive surgery, alternative bearing surfaces, direct anterior hip replacement, multimodal pain management and infection prevention. Dr. Perricelli has a clinical interest in postoperative pain management, as well as the prevention and management of infections, blood-loss management, accelerated recovery, and design of hip and knee replacement implants. Dr. Perricelli serves as the Chief of Orthopaedics at St. Clair Hospital. He also serves as a consultant, instructor and lecturer at the local, state, regional and national level on hip and knee replacement topics. He serves on the editorial board for the Journal of Arthroplasty, editing and critiquing cutting edge research involving hip and knee replacement. He is a member of the American Association of Hip and Knee Surgeons, American Academy of Orthopaedic Surgeons and the Pennsylvania Orthopaedic Society. He was recently selected as an emerging leader for AAHKS to serve at a national level. He is board certified by the American Board of Orthopaedic Surgery. Dr. Perricelli is married with one daughter. Meet Tom McMullen. A patient of Dr. Perricelli and St. Clair hospital. He was the first patient to go home on the same day of his knee replacment in the region!! Dr. Perricelli’s Comments and Interviews with the new medicare payment model and how they will change the patient experience. Dr. Perricelli’s Interview with improving quality in hip and knee replacement.